Our product range includes a wide range of prochlorperazine dimaleate, prochlorperazine mesylate and ondansetron hydrochloride. Prochlorperazine Dimaleate (84-02-6) is Solid. It is also known as Prochlorperazine maleate. 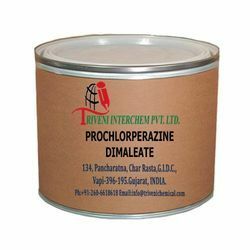 it is use in antiemetics Industry.Prochlorperazine Dimaleate (84-02-6) is Solid. It is also known as Prochlorperazine maleate. it is use in antiemetics Industry. Prochlorperazine mesylate (5132-55-8) is solid. it is use in antiemetics Industry.Prochlorperazine mesylate (5132-55-8) is solid. it is use in antiemetics Industry. Ondansetron Hydrochloride (103639-04-9) is Crystalline powder. it is also known as Tetrahydro.,, Storage: Keep container tightly closed. Keep container in a cool, well-ventilated area. Looking for Antiemetic API ?